St. Andre Bessette Catholic Secondary School’s production of “Bring it On: The Musical”. When many hear that title they instantly think of the movie. The musical is loosely based on the 2000 film by the same name written by Jessica Bendinger. Both focus on the competitive world of cheerleading and over-the-top team rivalries. The Original movie follows the plot of a champion high school cheerleading squad that discovers its previous captain stole all their best routines from an inner-city school and must scramble to compete at this year's championships. The film stars Kristen Dunst as Torrance Shipman. “Bring It On” opened in theaters on Aug. 25, 2000, and, given the film's under-the-radar production, there was very little hype. In reality, “Bring It On" defied the odds and opened at No. 1, making $22 million its first weekend and staying atop the box office in week two, adding another $15 million to its tally. The unexpected turn of events caught everyone off guard. The success of the original movie inspired five other movies within the “Bring it On” franchise, as well as a TV series by the same name. But if one plans on going to “Bring It On” the Musical and expected to see the theatre version of the movie they would be very disappointed. Yes in general terms the story is the same but it takes some very different turns in direction. The film did inspire the play but the plot line takes some twists away from the original story. “Bring It On: The Musical,” tells the story of Campbell Davis, a young cheerleader who dreams of leading her squad to victory at a National competition. The story focuses on the world of competitive cheerleading and the intense rivalries it creates. Campbell’s future is secure: a handsome boyfriend, a killer squad, and the newly awarded title of cheer captain. Suddenly, however, she is mysteriously reassigned to another school: the inner-city Jackson High, where she knows hardly anyone and worse: they don’t have a cheerleading squad! Despite the challenges of fitting in at a new school, Campbell befriends some tough girls on the dance squad and helps them become a powerhouse competitor for the National Cheerleading Championships. Featuring a sassy script and fresh new songs from Tony Award winners Lin-Manuel Miranda (Hamilton, In the Heights) and Tom Kitt (Next to Normal). Lyrics were by Amanda Green. 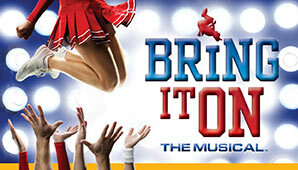 “Bring It On" has become a fan favorite! The musical premiered at the Alliance Theatre in Atlanta Georgia in January 2011. The original cast included Amanda Lea LaVergne as Campbell, Adrienne Warren as Danielle, Nick Blaemire as Randall, Ryann Redmond as Bridget, and “award-winning competitive cheerleaders from across the country”. A national tour of the musical played in major U.S. cities from November 2011 to June 2012. “Bring It On" was also the first Broadway musical to feature a transgender high school character, La Cienega, originally played by Gregory Haney. The book writer Jeff Whitty said, "In creating a universe of characters, I always try to find as many different perspectives as possible because that's where the comedy comes from most often." This is the first time this show has been performed in London, Ontario. The play was directed by Ms Heather Weis. The Musical Director is John Vermue. The Choreographer of the show was Ashleigh Wood. Wood brought her experience as a former Toronto Argonaut cheerleader to the show. The production features a talented cast with a couple of familiar faces to iFilmGroup. The talented Zach Wilson hits the boards once again. 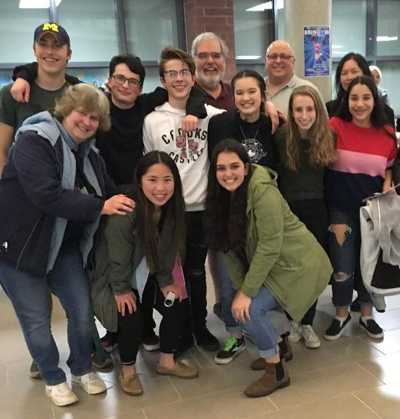 He is coming off being part of the “The Hunchback of Notre Dame” at the Palace Theatre by AK Arts Academy and now is in St. Andre Bessette Catholic Secondary School’s production of “Bring it On: The Musical”. As mentioned above the most prominent is Zach Wilson. He plays the role of Randall in the play. His role includes many songs but none that are as beautifully done as Randall’s song “Might as well enjoy the trip” which Zach sang wonderfully. 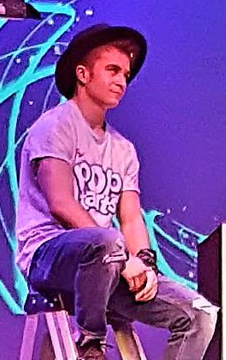 Zach is known through iFilmGroup for being a part of a number of their acting workshops as well as having roles in various productions associated with the group. He has been a part of “Malicious Attack”, “Summer of Discovery”, “Blue Love” and will be playing a major role in the newest production “Not Ready” which is slated for production this summer. Another iFilmGroup face is Sam Lepore who recently just made the connection with iFilmGroup. He is a grade 11 student at the school. He brought his acting and rapping skills to the table to play the role of Twig. Lepore wasn't originally in the play. He hadn’t even originally auditioned but his drama teacher added him after she heard him rap. He has always loved musical theatre and is looking to progress in his desire to act. The play gave him the opportunity to showcase his multiple talents. Other key players in the cast included Anna Bartlam in an outstanding performance as the lead Campbell. Anna Bartlam is a Grade 9 student at St. Andre Bessette. She is no stranger to the stage. She has performed in the Mirvish production of “The Heart of Robin Hood” and in the Drayton Entertainment productions of “Brighton Beach Memoirs”, “White Christmas”, “The Music Man” and “The Sound of Music”. She was in Grand Bend’s Huron Country Playhouse production of “Annie” and “The Wizard of Oz” at Huron County. She also has been a part of “A Christmas Carol” on the Grand Theatre’s Spriet Stage. Her television and animation voice-over credits include “True” and the “Rainbow Kingdom” on Netflix, “Anne With an E” on CBC and Netflix, “The Next Step” on the Family Channel, and “Super Why”, “Space Ranger Roger” and “Peg + Cat” on PBS Kids. Bartlam was supported by other key roles such as Susy Lugo as Danielle, Narine Titizian as Bridget and Nadia Whalen as Skylar. The question was asked of Director, Heather Weis why this show? 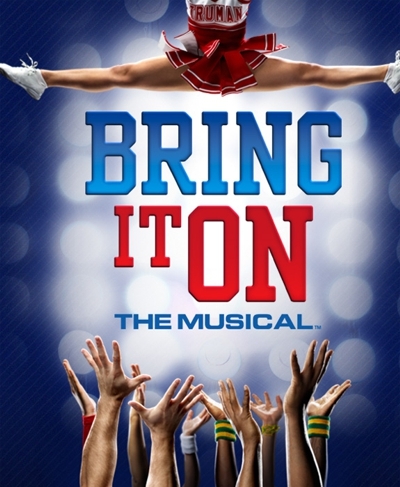 The truth be told “Bring It On: The Musical” never made the original cut of shows for the school to do. But the shows that had made the short list never felt entirely right. So they were scrapped. “Bring it on: The Musical” fit the criteria of what the school and its creative team were looking for on a number of levels. For many, it may have not been the first choice of a High School Musical Production. If some of the cutting edge content and cultural stereotypes within the show don’t cause a moment of pause. Then the level of difficulty of the show to mount and put on is something that challenges anyone who decides to do the show. As a musical it not only involves acting, singing and dancing. It also involves the fourth element of “cheer”. And it is not a show where you can fake it. Because the entire show is about cheerleading. To find a group of high school students that can bring all four elements together is not an easy task. But St. Andre Bessette rose to the challenge and put on a dynamite production that wowed the audience. The multi-cultural and diverse cast brought home all the content and issues and even the cheerleading in an authentic and real way that spoke to the audience members who saw the production. The play teaches some valuable lessons and looks at the bigger picture of life lessons like; breaking down barriers and stereotypes. But it doesn’t stop there. It also looks at things like dedication, teamwork, trust, support, friendship and having fun during the process. Because if you’re not having fun then the final product doesn’t matter. Many life lessons are taught to everyone involved through the production. This is a show that offers an opportunity for growth. Growth in ability, character, tenacity, and resolve to work through the process. For mentorship to happen among those that are a part of it through the process. It is a production that speaks to the iFilmGroup Production Team because it mirrors what the iFilmGroup strives to accomplish through its members. 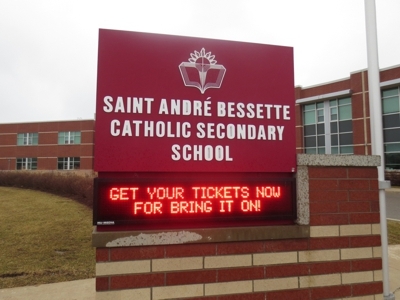 iFilmGroup congratulates the entire cast and crew of St. Andre Bessette’s “Bring It On: The Musical” on a wonderful production.